A MESSAGE FROM BARTIMAEUS . . . Here are the answers to some frequently asked questions about Bartimaeus and his world. Jonathan will add more here from time to time. If YOU have a burning question that you’d like him to answer, and to see his responses to many, many others that have already been posted, visit the fantastic Bartiforums site at bartiforums.com. How do you pronounce Bartimaeus? Bart – im – ay – us. How many kinds of magical spirit are there? There are countless varieties of spirit, from beings of colossal power to tiny mites no bigger than your thumb. For simplicity, magicians have divided most spirits into five main types: imps, foliots, djinn, afrits and marids, with imps being the weakest and marids the most powerful. But within each group are lots of subtypes. 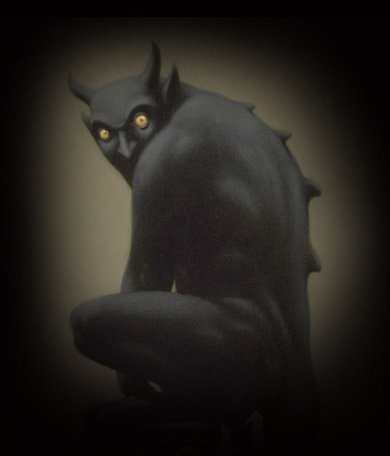 Ghuls are a nasty sub-type of djinn. Skrikers are an especially disreputable type of imp. Additionally there are spirits who fall outside the main brackets, such as the Elementals, and a few terrifying entities who are much more powerful than even the strongest marid. What are spirits made of? All spirits are made of essence, which is the substance of their own world or dimension – The Other Place. The more essence a spirit contains, the stronger they are. Essence is weakened by coming to Earth, and needs to return to the Other Place to be restored to health. Can a spirit develop in power? For example, could an imp become a djinni, or a djinni turn into an afrit? No. When a spirit is first summoned by a human magician, the quantity of essence they contain is fixed for good. This means their basic powers and limitations are fixed too, although (like us) they learn and develop with experience. A 5,000-year-old djinni such as Bartimaeus is no more powerful now than he was when he was first summoned back in 3000 BC, but his personality may be very different. What’s the difference between a ‘spirit’ and a ‘demon’? ‘Demon’ is simply a rude term for a spirit. The word comes from the Greek ‘daimon’, which wasn’t originally abusive, but over centuries the term, used mainly by magicians to refer to their slaves, became loaded with hate and fear. Who were the first magicians? The first magicians were probably shamans and witch-doctors in early hunter-gatherer societies who developed techniques of astral travel, during which they met (on more or less equal terms) with spirits from the Other Place. At the dawn of urban civilisation, in the land of Sumer, new techniques were discovered that pulled spirits unwillingly out of the Other Place to become slaves on Earth. By about 3000 BC, when Bartimaeus was first summoned, the basic methods of summoning using circles, pentacles and words of binding had been perfected, and are still used in the present day. Are all spirits slaves when they come to Earth? Yes. Being on Earth is painful to them, and they come unwillingly. A magician must bind them with strong word-bonds to force them to remain to do his or her bidding. With time, a few spirits form attachments to their masters, or begin to enjoy some aspects of their work, but they remain slaves, even so. Who was the greatest magician? In many ways the earliest magicians of Sumer and Egypt were probably the greatest, because they were the ones who devised the methods of enslaving spirits. Most of their names are lost. Great figures such as the magician-kings Gilgamesh and Solomon have enduring reputations, but this is as much to do with the glamour of power as to their magical skill. Solomon’s repute derives entirely from his ownership of the magic ring: whoever created that ring was a far more skilful magician than he. In later centuries, Zarbustibal of Yemen stands out because he refined and improved many of the ancient techniques. The formidable Gladstone was probably the greatest magician of the last few hundred years. Who was the most powerful spirit? This is unknown. The Spirit of the Ring, known only as Uraziel, is certainly a possible contender. What are the magicians’ lenses, and how to they enable them to see spirits? For centuries, magicians have worn special glasses (and in recent times, contact lenses) made of ground crystal, which allow them to perceive the second and third planes (and the fourth dimly). These eyepieces were developed during the glory days of the Arab Empire in the time of Haroun al-Rashid. The exact process is a closely guarded secret – it may be that some minor variety of imp is imprisoned within each crystal and forced to reveal exactly what it sees on these planes. Early pioneers probably attempted to imprison higher spirits, only to have them shatter the glass. Perhaps the human brain is only capable of viewing three planes simultaneously, even with the aid of magic.